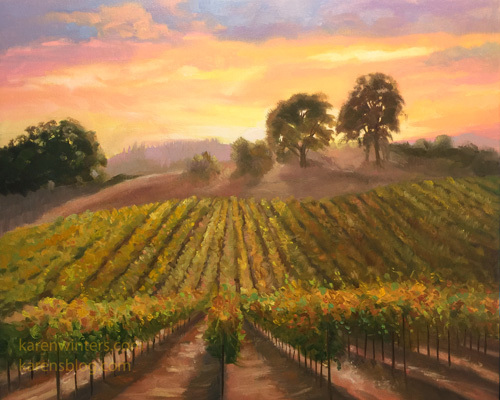 This recent painting was completed before the terrible wildfires swept through the Napa and Sonoma areas. I was afraid to look at the fire maps for fear that this beautiful vineyard, quite close to the city of Napa, had been harmed. Thankfully, it seems to have survived just fine. I look forward to my next painting trip to the area. Last autumn, while visiting our children over Thanksgiving, we had the pleasure of visiting this wonderful vineyard on Spring Mountain near St. Helena, above Napa Valley, California. The wines were superb and we thoroughly enjoyed the tour which was given by a very knowledgeable and entertaining man who was also a refugee from the advertising business, like me. The day was magical in every way. We picnicked on a hillside overlooking the vineyard fall color. 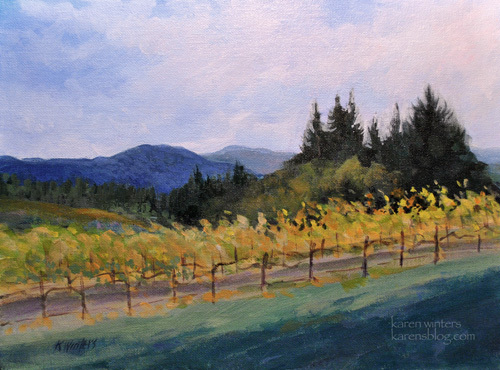 Bread, wine, cheese, sausages, more wine, fall color, crisp air … ahhhh. This commissioned painting evolved out of that delicious fall inspiration. 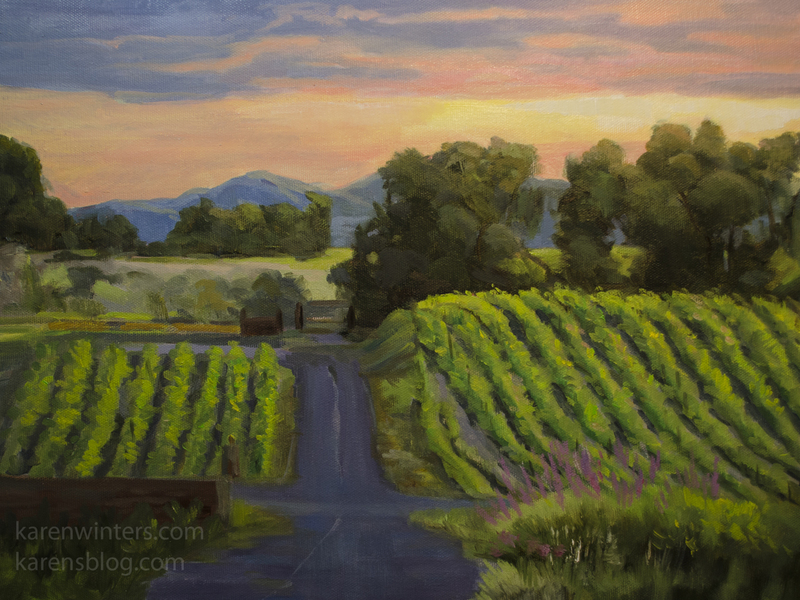 I’d love to go back there again to paint in another season – maybe while the grapes are still on the vines. Show reminder: The California Art Club 100th Annual Gold Medal show continues at the Pasadena Museum of California Art – through April 21. Check the museum website for days and hours. Be sure to see my painting, “Gaviota Springtime.” It’s in the side room where the smaller works are hung.